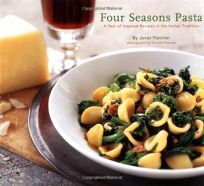 An award-winning food writer for the San Francisco Chronicle pairs pasta with seasonal vegetables in a succinct collection of recipes that should become a family standby. Focusing on fava beans in the spring, eggplant in the summer, mushrooms in the autumn and hearty greens in the winter, Fletcher (Pasta Harvest, etc.) combines time-saving techniques with solid advice about what makes good food good: fresh ingredients, prepared with care. The introduction quickly covers the basics of keeping a pantry stocked, then moves on to a comprehensive discussion of pasta itself. Inferior quality pasta is cut with Teflon dies rather than bronze ones, Fletcher explains; that's why sauce slides off cheap noodles. The best part of the book, however, is the range of its recipes. A few, like the autumn Pumpkin Ravioli with Fried Sage, take several hours to prepare and produce party-quality results. Others, like the spring Spaghetti with Asparagus, Fried Eggs, Black Pepper and Pecorino, can be made in about the time it takes to boil a pot of water. The winter Penne with Mustard Greens, Ricotta and Pecorino uses the same water to blanch the greens, boil the noodles and make a cream sauce: the results are homey and tasty. Some vegetables available in the United States have been substituted for Italian specialties: autumn Corkscrew Pasta with Brussels Sprouts, Sausage, Tomatoes and Cream is hardly traditional but fits the Italian philosophy of using fresh local ingredients. Victoria Pearson's photography rounds out the collection, focusing on the finished pasta in each photo, without extraneous garnishes. This is a cookbook that is truly helpful: simple fast recipes that expand a home cook's repertoire of consistently delicious meals.